Propulsion: Two nuclear reactors, four shafts. Length: 1, 092 feet (332.85 meters). Beam: 134 feet (40.84 meters) ; Flight Deck Width: 252 feet (76.8 meters). Displacement: Approximately 97, 000 tons (87, 996.9 metric tons) full load. Speed: 30+ knots (34.5+ miles per hour). Crew: Ship's Company: 3, 200 - Air Wing: 2, 480. Armament: Two or three (depending on modification) NATO Sea Sparrow launchers, 20mm Phalanx CIWS mounts: (3 on Nimitz and Dwight D. Eisenhower and 4 on Vinson and later ships of the class.). Aircraft: 85. The ship was christened on 11 November 1993, in honor of Senator John Cornelius Stennis (D-Mississippi) of who served in the Senate from 1947 to 1989. The daughter of the ship’s namesake, Mrs. Margaret Stennis-Womble was the ship’s sponsor. Stennis was commissioned on 9 December 1995 at Naval Station Norfolk, Va, and she conducted flight deck certification in January 1996. The first arrested landing was by a VX-23 F-14B. The ship conducted numerous Carrier Qualifications and Independent Steaming Exercises off the East Coast throughout the next two years. Included among these events was the first carrier landing of an F/A-18E/F Super Hornet on 18 January 1997. USS John C. Stennis and the smaller British Invincible-class HMS Illustrious on a joint patrol, April 1998. On 26 February 1998 with Carrier Air Wing Seven embarked, Stennis left Norfolk for her maiden deployment, transiting the Suez Canal on 7 March and arriving in the Persian Gulf on 11 March 1998. The ship travelled 8020 nm in 274 hours, an average speed of 29.4 knots (54.4 km/h) to relieve USS George Washington (CVN-73) in conducting Operation Southern Watch missions. Stennis departed the Persian Gulf on 19 July 1998 for her new home port of Naval Air Station North Island in San Diego, California, arriving on 26 August 1998. In October 1998, Stennis entered a 6-month Phased Incremental Availability for maintenance and upgrades at North Island, returning to sea in April 1999. During the maintenance period, a jet blast deflector collapsed, severely injuring two sailors. On 30 November 1999, Stennis ran aground in a shallow area adjacent to the turning basin near North Island. Silt clogged the intake pipes to the steam condensing systems for the nuclear reactor plants, causing the carrier’s two nuclear reactors to be shut down (one reactor by crew, the other automatically) for a period of 45 minutes. Stennis was towed back to her pier for maintenance and observation for the next two days. The cleanup cost was about $2 million. On 7 January 2000, Stennis deployed to the Persian Gulf to relieve USS John F. Kennedy (CV-67) in Operation Southern Watch. During the deployment, the ship made port visits to South Korea, Hong Kong, Malaysia, Bahrain, the United Arab Emirates and Australia, before returning to San Diego on 3 July 2000. Following the 11 September 2001 terrorist attacks, Stennis conducted Noble Eagle missions off the U. S. West Coast. On 12 November 2001, two months earlier than scheduled, the ship left on her third deployment to the U. S. Fifth Fleet area of responsibility in support of Operation Enduring Freedom, returning to San Diego on 28 May 2002. From June 2002 to January 2003, JCS underwent a seven-month Planned Incremental Availability (PIA). From 24 May to 1 November 2004, Stennis conducted her fourth major overseas deployment, participating in Exercise Northern Edge 2004 in the Gulf of Alaska, Rim of the Pacific (RimPac) Exercise off Hawaii, exercises with Kitty Hawk off Japan and goodwill visits to Japan, Malaysia and Western Australia. Shortly after returning from deployment to San Diego, JCS changed her home port to Naval Station Bremerton, Washington on19 January 2005. Once at Bremerton, Stennis underwent an 11 month Docking Planned Incremental Availability (DPIA), the first time she had been dry-docked since commissioning. Upgrades included a new mast. USS John C. Stennis arrives in Bremerton on 31 August 2007. On 20 January 2007, Stennis set sail for the Persian Gulf as part of an increase in US military presence within the Middle East. 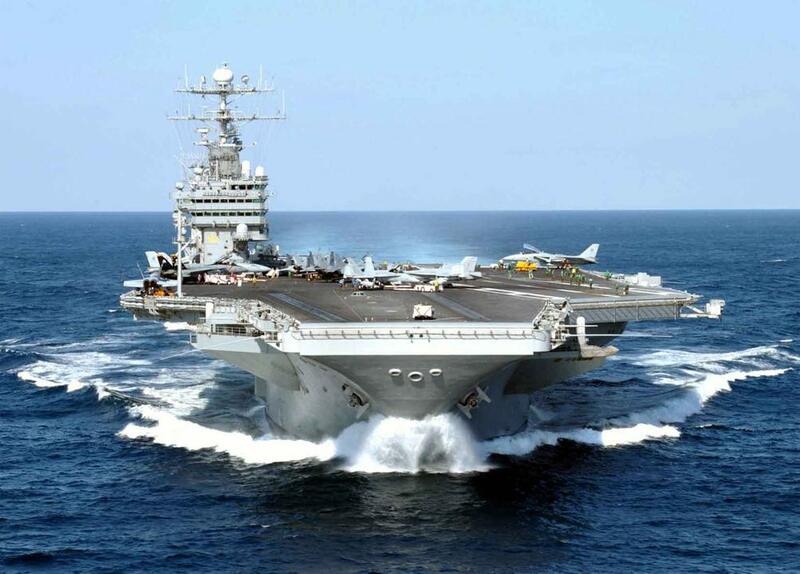 Stennis arrived in the area on 19 February 2007, joining USS Dwight D. Eisenhower in the United States Fifth Fleet area of operations This marked the first time since 2003 that there were two aircraft carrier battle groups in the region simultaneously. On 23 May 2007 Stennis, along with eight other warships including the aircraft carrier Nimitz and amphibious assault ship Bonhomme Richard, passed through the Strait of Hormuz. US Navy officials said it was the largest such move since 2003. On 31 August 2007 Stennis returned to Bremerton. Stennis departed Bremerton for a 6-month deployment to the Western Pacific on 13 January 2009. On 24 April, the ship arrived in Singapore. That same day, one of the ship's sailors was crushed and killed while working from a small harbor boat to secure a drain that discharges oily water from Stennis’ aircraft catapults. On 29 April, the ship's executive officer, Commander David L. Burnham, was relieved by Rear Admiral Mark A. Vance over unspecified personal conduct. Burnham was reassigned to a base in San Diego, pending an investigation. After participating in operations in the Persian Gulf, exercises with Japan Maritime Self Defense Force and the Republic of Korea, as well as joint exercise Northern Edge 2009, USS Stennis returned from deployment in early July 2009. Carrier Air Wing 9 debarked on 6 July at NAS North Island, prior to the ship's arrival at her homeport of Bremerton, Wash., on 10 July.